I’m very pleased to announce that I am speaking at the Business of Architecture Summit, an online conference for small firm and solo practitioners. Two days of CES-approved training sessions are presented by leading experts who know the challenges that small architecture firms and sole practitioners face (and the solutions to those challenges). The Summit focuses on the 3 pillars of a strong practice – attracting and winning more of the right kind of projects, project management and delivery, and strategies to make and retain more profit. My talk on Internet Marketing for Architects is on at 3 pm PDT on Friday October 17, 2014. My behind-the-scenes interview with marketing ‘hired gun’ who had a struggling residential architecture firm increase their prices by 30% and booked solid in 4 months. What is the secret of this “Monkey’s Fist”?? And what does it have to do with bringing in a flood of new clients and projects to your design business? Please forgive me when I ask you this question. If you are such a good architect then why aren’t you busy with lots of projects right now? Part of the answer is that selling architecture services is still a challenge in this economy. But there’s a lot more to this question. Clients questioning your fees or worse still choosing a cheaper architect? Clients stalling and long delays? Losing deals to inferior architects? Being fully booked one month then wondering where you next client is coming from the next? Unfortunately being the best architect will not make you rich. Here are three highly profitable companies who do NOT make the best product. McDonald’s doesn’t make the best burgers. But they all make tons of money. Because they are the best marketers. That is unfair and should not be the case but all of us have to live in the real world. ‘Fair’ is not the driving force in our business, marketing is. Sure you need to be a good architect however that won’t automatically bring you clients, since it’s likely there are many good ones in your area. You need to be the best marketer of architecture services. Architecture school does not teach that. I am very excited to say that I will be interviewing a guy who will be able to help you make 2014 a breakthrough year. A colleague interviewed a Kiwi architect who was doing extremely well in New Zealand. This architect talked about how she went from struggling to get leads even and was discounting her fee. She then found a marketing ‘hired gun’ who specialized in selling professional services and within four months was booked solid and had over 120 leads. Plus, get this, she had increased her fee by 30%. The stuff Mona was doing was NOT the typical stuff we are used to architects doing. In fact in some cases it broke every rules we had ever been taught about selling. But it worked brilliantly and clients seemed to love this new approach. At the end of the interview everyone who watched wanted to know who she had worked with because his name was never mentioned. The marketer was only referred to several times as ‘my expensive marketing guy’. This drove people crazy including me so to cut a long story short I made a few calls, found out his name and asked if I could speak with him directly about marketing for architects. Be ready for something different, provocative, and challenging. These strategies are not your typical run of the mill ideas used by architects. Here is a taste of what Richard will be covering. How to attract the most profitable clients and repel the clients who want everything for free. The ‘marketing guy’ has agreed not to just share strategies but also the mindset required to transform your thinking about selling and buying architecture services. Block out your calendar on Wednesday September 25 at 1 pm PDT and don’t let anything stop you from joining us for this exclusive interview, which will transform 2014 for you. Our interview yesterday was very well received with over 140 people attending, my best ever! The video recording is now posted (for a limited time) on my new Architects Marketing website. There will be a follow-up webinar with Richard Petrie, in which he will go over his entire Architect Client Getting System on Wednesday October 9 at 1 pm PDT – you can register for this free webinar here. 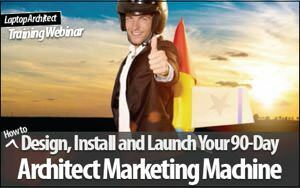 If you’re an architect or building designer, this free Architect Marketing training webinar is for you. As you probably know, last year I became increasingly involved in helping my architect clients use internet strategies to generate leads. I even launched my Internet Marketing for Architects training course… then something interesting happened. Through my research on other architect marketing specialists (my competition I thought) I stumbled across this strange name: ‘String Nikolic’. An offline architect marketing specialist from ‘down under’. Long story short, I checked out what he’s teaching, connected with him and finally (it’s taken about 3 months) he presented his unique marketing system last month to my Architect Marketing Coaching program members. The response from my members was incredible. With the success and feedback from this training webinar, I’ve convinced String to run a free online training on his ’90 Day Architect Marketing Machine’ – and you’re invited. String has only 100 spots for this training (maximum limit on his webinar platform) plus he’s inviting his list of architects. So if you are interested I recommend registering before it fills up. I apologize if the webinar is already full by the time you read this. We may offer it again, or make a replay available. I’ll have to talk with String to see what he’s willing to do. String gave me a preview of the presentation and it looks awesome. I twisted his arm and got him to agree to share the slides with me and allow me to post them for you to look over. I suggest you download and print them so you have them handy while you watch the training. They’re set up as miniature slide images with space to write your notes. If you are tired of spending money on advertising with mixed results then this is for you. Or if you’ve been just waiting for the phone to ring, not knowing what to do to bring in business, then you absolutely can’t afford to miss this presentation. P.S. String told me that he’ll stay on as long as needed to answer questions LIVE on the call. I don’t know about you, but I prefer to ask specific questions about what to do right now rather than just go through theory. I haven’t paid attention to this website for a while, and I intend to change that. When I last posted here in June, I was in the middle of presenting a series of webinars on Internet Marketing for Architects. Now, almost three months later, I’ve launched an entire course on Internet Marketing for Architects, and presented 8 out of 12 weekly training lessons with very positive feedback. It’s been a rather all-consuming summer of work on many fronts: in addition to launching the IMA course, we upgraded MasterTemplate for ArchiCAD 16, I’ve been creating more lessons for my Best Practices Course, and producing more videos for my YouTube channel. Traffic to my YouTube channel has continued to increase, and we recently passed 400,000 views, less than 5 months after hitting 200,000. I guess I must be doing something right… people are recommending the channel to their friends and colleagues, and we now have over 1850 subscribers. This fall, I’ll be launching several different initiatives that I’m excited about. To start out, I’ll be introducing a series of 3 mini-courses for specific ArchiCAD topics: Site Design and Terrain Modeling, Roof Design and Documentation, and the FastTrack! Course on optimizing your speed and accuracy in general. Look for an announcement next week on these very affordable and extremely targeted training series. I’m going to celebrate the YouTube milestone by awarding 4 prizes for these new ArchiCAD training courses to subscribers. If you’d like to win one of these all you have to do is visit my YouTube channel and subscribe (just click the button – it’s easy). I’ll pick 4 subscribers and give them a free training course to thank everyone for their support and encouragement as I continue to develop my comprehensive Best Practices Course into the richest and most effective training for ArchiCAD users. I’ll be back soon with more news about the fall. There is a LOT that I have in the pipeline that I know you’re going to love! Wow, how fast things change. In my last post here on this site on March 27, my YouTube channel had 191,727 views; as of today (less than 12 weeks later) it’s at 312,375! My reach (the number of people I’m influencing) has gone up dramatically. I’m truly seeing the power of internet marketing. In March, I was just starting to see the possibility that one of my websites could rank on page 1 for a Google search for ArchiCAD. As of today, I occupy positions 6, 8 and 10 on page 1 for my three sites. 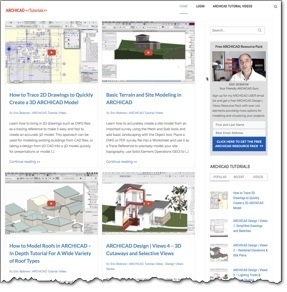 Anyone who is doing research on ArchiCAD will quickly become aware of my products and services, and eventually visit my websites and perhaps become a client. These strategies work just as well for architectural firms. One of my clients is a small firm in Los Angeles that now sits firmly in the #1 position for some common Google searches, and brings in all the work they can handle from their online efforts. If you’d like to learn more about how to use Internet Marketing strategies to bring in more clients and projects, and grow your business as an architect or building design professional, I invite you to join me in one of my free training webinars. Can you afford to wait any longer to master Internet Marketing? Click here to sign up now for this exciting free webinar training! P.S. Help me out…I’d love to know your most burning question or frustration – or two or three – on this topic. Post a comment here or send me an email – it will help me a lot as I prepare what I’m about to share with you on how to apply internet marketing strategies for architects.